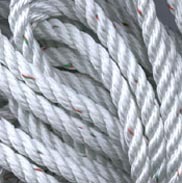 Strong, durable, flexible and shock absorbent a good line for moorings, anchor line, dock lines and many other uses. We sell only top brand first quality line. The same we have used on out pendants for years. Used on pennants or anchor lines and will give years of service.